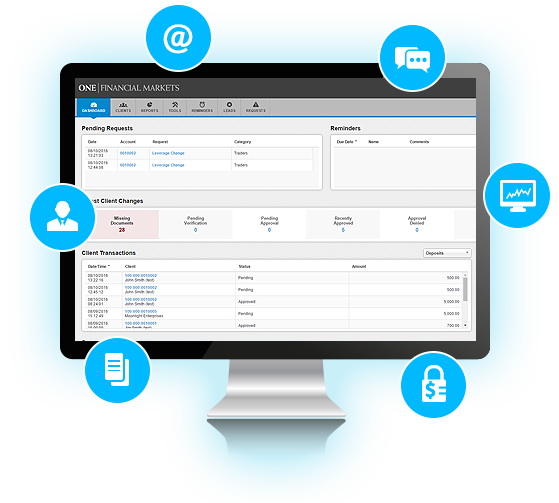 Our Client Portal is designed exclusively to improve the service we offer and to assist with the day to day management of your account. Our client portal is an easy to use personal account management tool that allows you to: view the status of your application, manage your demo and live accounts, upload documents, deposit, transfer or withdraw funds, request additional trading accounts, manage your personal details, control your communications preferences and more. In order to login to your client portal please click here to get to the login page. Your username and the password are the email address and password provided in your application form. Click on ‘login’ button to access your portal. What is a ‘Landing Account’ and how does it work? If you select ‘USD’ as the base currency for your trading account at the time of registration, you will be set up with a USD landing account and should you wish to have a trading account in a different currency, we shall set you up with a different currency landing account. Please note that your trading account will be linked to the associated landing accounts based on the currency you select i.e., there will be one landing account per currency. 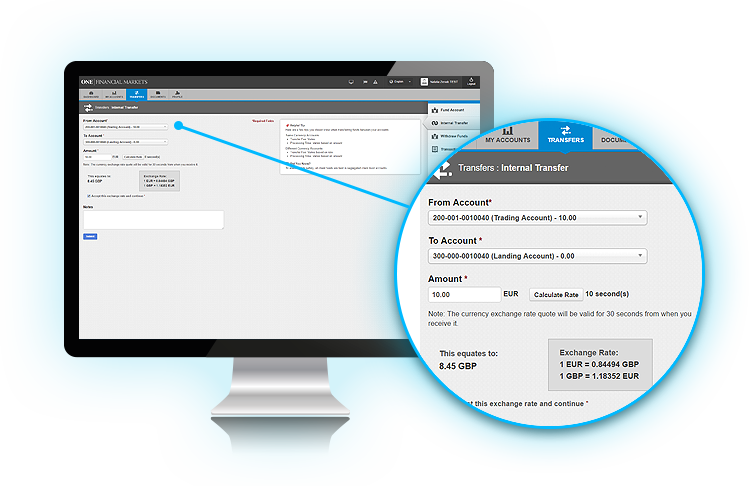 We currently offer trading accounts in three currencies USD, GBP and EUR. Please contact our Client Services Team if you have any questions or for more information. How do I transfer funds from my landing account to my trading account? Click on the ‘Transfers’ tab at the top of your screen, select your landing account by clicking on the ‘From Account’ drop down option and then select the applicable ‘To Account’ drop down option, enter the amount you wish to transfer in the ‘Amount’ field and click “submit”. You will then see the transfer confirmation message and funds will have been moved. You can check your account balance(s) by navigating to the ‘My Accounts’ tab. Can I transfer funds between my landing accounts? Yes. Click on the ‘Transfers’ tab at the top of your screen, select the applicable landing accounts in the ‘From Account’ and the ‘To Account’ drop down options, enter the amount you wish to transfer in the ‘Amount’ field and click “submit”. As you are making a transfer between different currency landing accounts, the exchange rate will be automatically calculated via an inbuilt calculator using current market prices. If you are happy with the rate please click “submit”. You will then see the transfer confirmation message and funds will have been moved. You can check your account balance(s) by navigating to the ‘My Accounts’ tab. Can I access Web Trader from the portal? Yes. 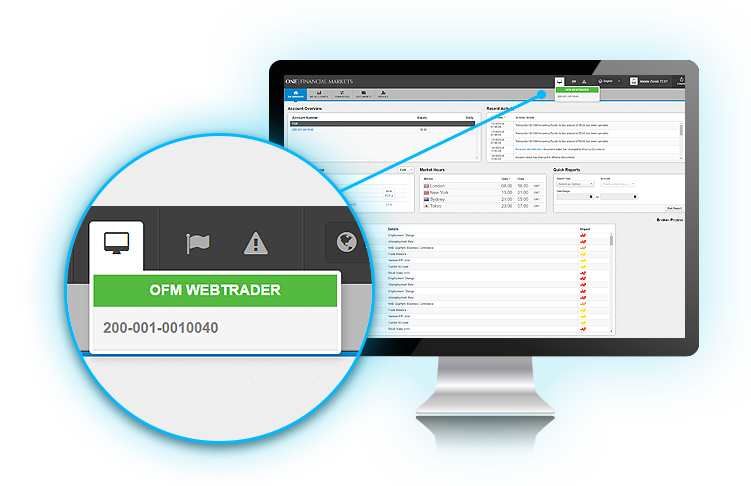 You can now access our Web Trader directly within your client portal. You will no longer need to navigate away to our website or email to access the link. 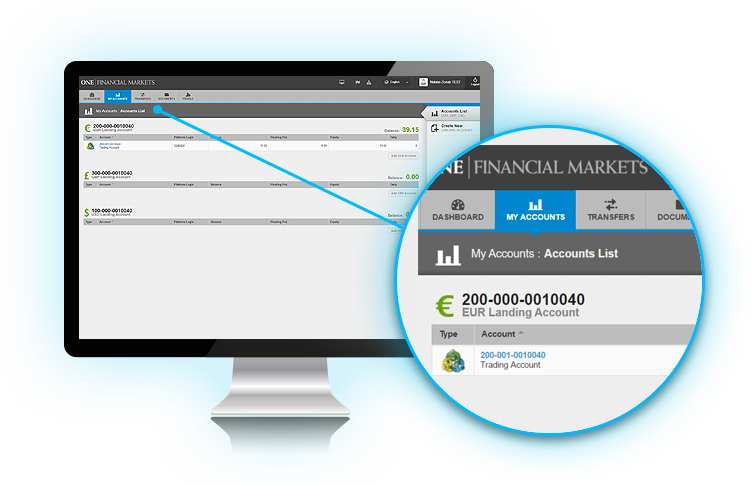 Simply click on the link in the top menu bar, select your account number and start trading! 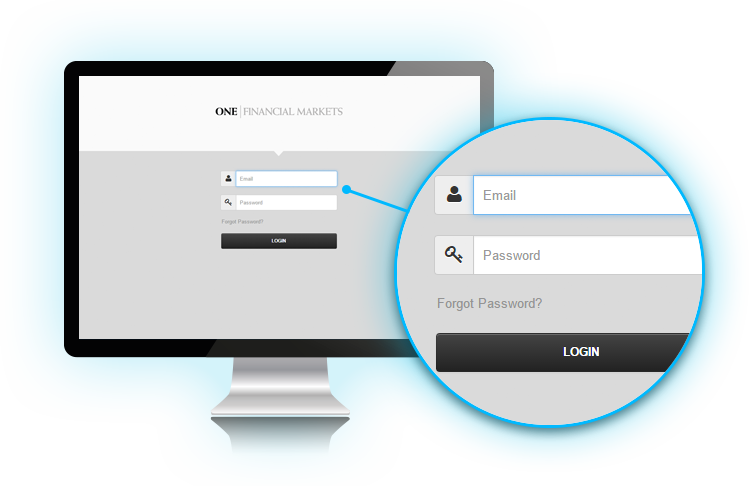 Please click on ‘Forgot Password’ link on the login page in order to reset your password or contact our support team at clientservices@ofmarkets.com for assistance. Your portal allows you to save different ‘Funding Sources’ for your trading accounts. In order to improve the efficiency of fund withdrawal payments, please update your bank details in this section. Click “add new funding source” and complete the applicable fields. What information can I view on the dashboard? Your dashboard shows all recent activities, i.e., payments, internal transfers and withdrawals, as well as Market Hours and other important information. You can also view your account equity details in the ‘Account Overview’ window. Furthermore, the Market News window shows latest notifications with regards to financial market updates, financial instruments in focus, any new events and their impact on the Markets. In order to change your trading account password, please go to the ‘My Accounts’ tab at the top of your screen and select the relevant trading account. For any technical issues with your client portal or trading platform please contact our support team at clientservices@ofmarkets.com or call us on 0044 020 7534 0555. You may also access our ‘detail change form’ here. Please fill out the form and send to our support team at clientservices@ofmarkets.com. What languages is it available in and how can I change my language preference? 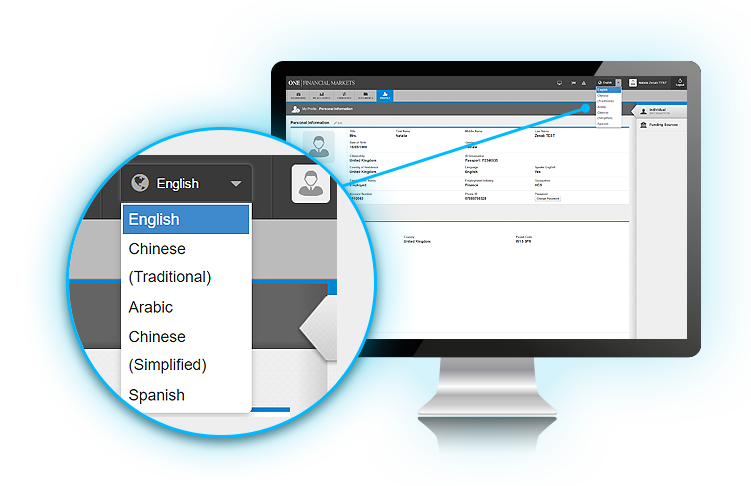 Our client portal is available in a selection of different languages for your ease and convenience. Please click on the ‘Profile’ tab at the top right of your screen and choose your preferred language from the drop down options. Can I provide my supporting documents via the portal? Yes. You are now able to upload supporting documents straight to your portal so our KYC team can review them. Upload documents via the ‘Documents’ tab at the top of your screen. In this tab you will see two document upload links under ‘My Documents’ heading. Click on the grey arrows below the ‘Actions’ heading and upload your documents. Note: Please note that acceptable file types are: jpg, gif, png or pdf. Maximum size of file that can be uploaded is 3.3MB. Note: We have a regulatory duty to provide you with account statements so please be aware that it may not be possible to unsubscribe from e-statements. How secure is my Client Portal? 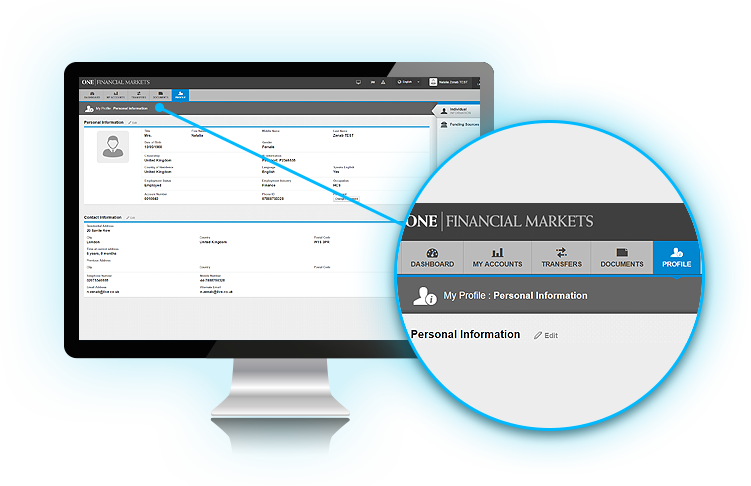 Our new client portal is designed to enable our clients to manage all their personal and trading account details in a secure environment. Your password is unique and is not provided to any third party. The portal allows you to modify your account preferences and all activity and updates including recent transfers and fund withdrawals can be tracked by looking at your ‘Recent Activity’ window in the Dashboard.